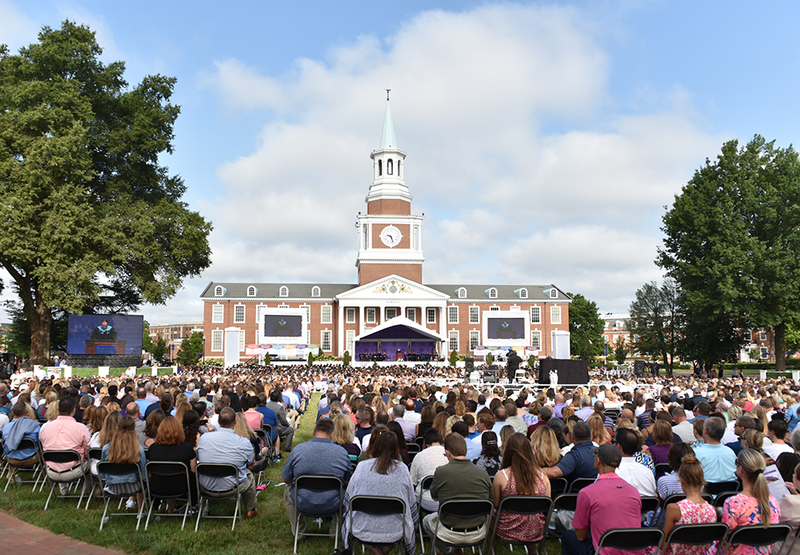 HIGH POINT, N.C., Aug. 29, 2018 – Three special awards were given to High Point University faculty members at the Convocation Ceremony on Aug. 19. 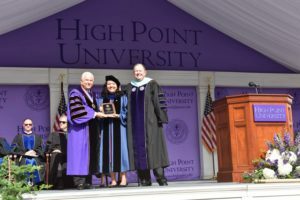 HPU President Dr. Nido Qubein commissioned the establishment of the three new faculty awards: Extraordinary Leadership Award, Innovation and Creativity Teaching Award and Spirit of High Point University Award. Dr. Angela Bauer received the Extraordinary Leadership Award at the Convocation Ceremony on Aug. 19. Pictured from left to right are HPU President Dr. Nido Qubein; Dr. Angela Bauer, chair of the Department of Biology; and Dr. Dennis Carroll, HPU provost. The Extraordinary Leadership Award was presented to Dr. Angela Bauer, chair of the Department of Biology. This award recognizes an HPU faculty member who has distinguished himself or herself through providing extraordinary leadership contributions that advance the excellence of the university. Extraordinary leadership contributions may be evidenced through innovative programs, university service, scholarly work and creative expression. The Department of Biology has doubled in the number of majors since Bauer arrived in 2013. Bauer has led the hire of 10 new faculty who represent diversity and specialized areas of expertise. Bauer has also led the department to focus on innovation, curricular change, co-curricular experiences outside the classroom and competitive student performance on nationally ranked exams. The Innovation and Creativity Teaching Award was presented to Dr. Veronica Segarra. 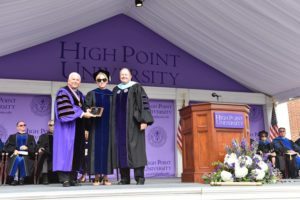 Pictured from left to right are HPU President Dr. Nido Qubein; Dr. Veronica Segarra, assistant professor of biology; and Dr. Dennis Carroll, HPU provost. The Innovation and Creativity Teaching Award was given to Dr. Veronica Segarra, assistant professor of biology. This award recognizes an individual who exhibits traits and characteristics such as the creation of a unique body of research using divergent thinking, imagination and risk taking. This person models innovation in the classroom by putting curiosity, problem solving, critical thinking, deep understanding and creative brainstorming at the center of the course curriculum and classroom practice. Since Segarra arrived at HPU in 2015, she has demonstrated clearly how she epitomizes an innovative and creative teacher. She developed and launched “EURICA! – A Cell Art Collaborative” (Emerging Undergraduate Research-Inspired Cell Art), which is a program that integrates the arts and sciences. 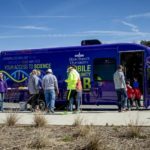 Segarra collaborated with several colleagues in developing the HPU Mobile Community Science Lab, a lab on wheels that visits local schools to allow students to get involved in science lessons. She developed a service learning component in her cell biology course and has continued as an active scholar and undergraduate research mentor. 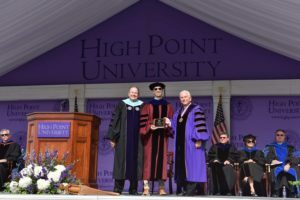 Dr. Joe Blosser, the Culp Director of Service Learning, received the Spirit of High Point University Award. Pictured from left to right are Dr. Dennis Carroll, HPU provost; Dr. Joe Blosser, Culp Director of Service Learning; and HPU President Dr. Nido Qubein. The Spirit of High Point University Award was presented to Dr. Joe Blosser, the Culp Director of Service Learning. This award is intended for a faculty member who exemplifies and aligns his or her value and belief system in accordance with the university community and its historic relationship with the church. This faculty member leads by example and encourages colleagues and students to have a deeper understanding and expression of his or her faith. As the director of the Service Learning program and as a consummate community activist, Blosser received this award because he “walks the talk” in the community. Described as having a “righteous urgency,” Blosser works to see that HPU students pick up the banner of intellectual rigor in the classroom and have moral reserve beyond it. Blosser teaches HPU students to have their intellect shaped by love that looks beyond the borders of their own interests. 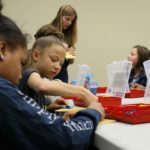 Blosser was instrumental in the development of the Greater High Point Food Alliance and in the creation of the Bonner Leaders program.